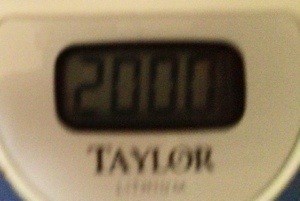 I started my diet on June 10, 2012 after weighing in at 249.5 pounds. Today, I’m a slim trim 199.5 pounds (200 counting my iPhone used to take the picture below). With Dr. D’Amamo’s blood type diet as my guide I set out seven seemingly short month’s ago to get down to what the BMI charts said that I was no longer considered “overweight”. That happened today. Now along the way I travelled and took breaks from reduced consumption but I almost always ate the correct foods to help me remain healthy. Surprisingly, I travelled the Middle East in November with my brother for three weeks and actually lost two pounds. I never worried much about my consumption but did concentrate on what I ate. The side benefit is that I never get heartburn any longer which, according to the doctor, is likely because I’m blood type O and allergic to Dairy or Wheat. This entry was posted in Health and Fitness, Traveling and tagged Blood type, diet, health, Weight Loss. Bookmark the permalink.